Tanvi Rao is a TCi Scholar and PhD Candidate in Applied Economics and Management at Cornell’s Dyson School. part by demand, is socio-economically uneven. pitfalls. The payoff was tremendous in terms of clean and reliable data. metadata, automatically, like start and end times of each survey. 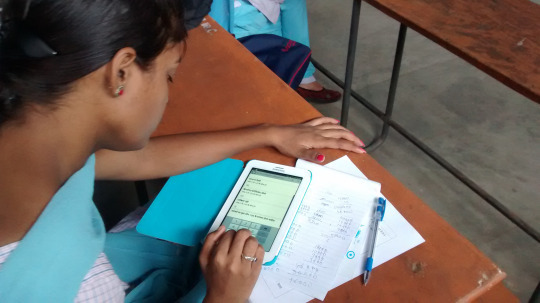 A student attempting the survey on an Android tablet. Photo by Tanvi Rao. By going digital I also learnt how to use OpenDataKit (ODK) an open-source (free!) and easy to use software for building, collecting and aggregating data. With no professional input and minimal coding, I was able to get my survey up and running in just a few days. Moreover, it was extremely easy to incorporate revisions in the survey instrument (my survey changed a lot after the first pilot) and look at my data as soon as it was collected to monitor glitches. Other highly recommended survey technologies include: audio recorders to monitor enumerator effort (hat tip to Julia Berazneva for the recommendation) and pocket-sized pico projectors, which I used to display my survey instrument and to assist enumerators in explaining the survey questions to the respondents as they filled out the survey. Another extremely useful device was a portable power bank (like a UPS to which electronic devices can be connected) that lasts at least 4-5 hours and can reduce dependence on unreliable (mostly unavailable in my case) local electricity. I got something like this in India. A survey in progress with one enumerator explaining the survey and the other (third row, left side) manning the pico projector. Photo by Tanvi Rao. Spend time recruiting, interviewing and training a good survey team. Previous survey experience is not as important as are qualities such as professional integrity, enthusiasm, strong inter-personal and communication skills as well as being a willing learner and having some appreciation for research. No one in my team had worked in a large-scale survey, but they were all young (under 28), most were recent graduates of the university and all worked hard to ensure the timely completion of the project. Celebrating survey-milestones and doing non-work related activities together was also a big and continuous part of teambuilding! Almost never do things go according to plan while in the field. Fortunately, dealing with panic attacks soon becomes second nature as you start thinking on your feet to come up with creative workarounds. Our initial strategy was to randomly sample from lists of enrolled students, but soon we realized that student-attendance in most months was less than 5% of the enrolled students. We responded by mobilizing students and spreading the word in private tutoring classes where these students took additional lessons, in student hostels, on important school days when attendance was high and once even via a local newspaper. These adaptations meant that our sampling frame and survey-timeline changed a lot, but this was better than no data at all. Other instances when we deviated from plan A, but survived, included a complete re-vamping of our survey schedule as state-elections hit Jharkhand and public colleges were converted to polling booths. We also had an enumerator drop out mid-way, but fortunately we had trained more enumerators than we needed at the beginning, and were able to re-group quickly. In remote areas, surveying respondents at institutions may be easier and cheaper than surveying respondents in their homes. On the flip side, you may face bureaucratic hurdles when it comes to working at institutions. Getting all permission upfront is necessary to ensure that your survey doesn’t become terminated mid-way. It is also important to work with skilled staff who understand the realities of the workings of the institutions under question. As you and your team make multiple visits to concerned authorities and put in long waiting hours, don’t get frustrated by thinking of this as time wasted. This is, indeed, time invested! *This blog first appeared on the Economics That Really Matters blog.